Since the minichromosome has a nucleosomal organization, post-transcriptional modifications of histones (acetylation, methylation or ubiquitination) regulates silent vs active DNA, and subsequently viral replication. For example, Pollicino and colleagues showed that histone hypo-acetylation and histone deacetylase 1 recruitment onto the cccDNA in liver tissue correlated with low HBV viremia in hepatitis B patients (Pollicino et al. 2006 ) Rating=2. In addition, levels of HBV replication paralleled acetylation, phosphorylation and methylation of cccDNA-bound histones H3, further arguing for the importance of histones modifications in cccDNA (Gong et al. 2011 ) Rating=2. HBV DNA has been shown to contain CpG islands that are methylated in liver tissues of patients with chronic hepatitis but no methylation was detected in serum samples (Vivekanandan et al. 2008 ) Rating=2. Subsequent studies showed that transfection of methylated HBV DNA in HepG2 cells leads to reduced HBV mRNA levels as well as decreased surface and core protein expression in these cells (Vivekanandan et al. 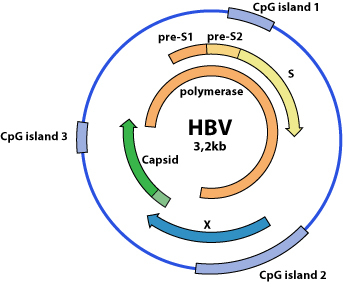 2009 ) Rating=2, showing that CpG islands regulate gene transcription of HBV. A study from the same team revealed a significant increase of CpG island 2 methylation in patients with occult HBV infection (HBeAg-negative patients) (Vivekanandan et al. 2008 ) Rating=2. Guo and colleagues observed a similar trend: cccDNA methylation of CpG island 2 was significantly higher in HBeAg-negative patients (65%) than HBeAg-positive patients (28%). (Guo et al. 2009 ) Rating=2. Cellular host DNA is also susceptible to HBx-induced DNA methylation (Vivekanandan et al. 2010 ) Rating=2 probably because of increased DNA methyltransferase genes (DNMT1, DNMT2 and DNMT3) expression in hepatocytes (Liu et al. 2009 ). Tumor suppressor genes are often concerned and their silencing might be linked to HCC. Examples of concerned tumor suppressor genes are E-cadherin (Lee et al. 2005 ) Rating=2 , p16INK4A (Zhu et al. 2010 ) Rating=1, GSTP1 (Niu et al. 2009 ) Rating=1 and retinoic acid receptor (Jung et al. 2010 ) Rating=1. The cellular machinery is able to down-regulate HBV minichromosome transcription, but it is still unclear if this happens in vivo. HBx might play a role in preventing this to happen.